This was inspired by a David Bowie song, Fantastic Voyage. 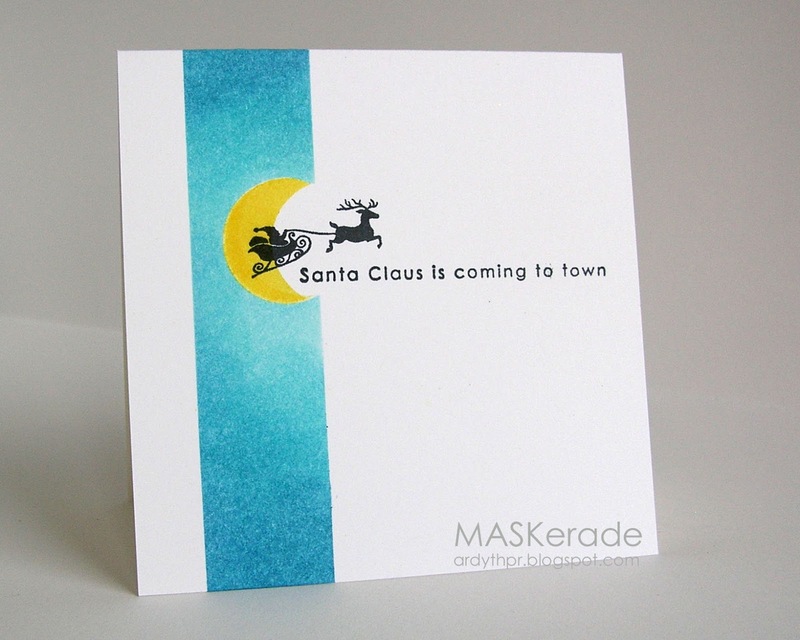 Unknown Santa stamp, Impress Rubber Stamps sentiment. This is just soooo clever, Ardyth, I love it! Ardyth you are sooo clever! LOVE this one so much!!! So glad you played along in this week's CAS(E) this Sketch! Wow! This is just too darn clever. Love this! I love your take on the sketch! It's such a great take! Sooo clever and super fab take on the sketch! Thanks so much for sharing at CAS(E) this Sketch this week! What a creative and fun design! I love how you've used the shape to make the moon - awesome stamping! I love your non- traditional colours! Such a clever and delightful take on the sketch! Absolutely stunning Ardyth and very clever! I love the way the moon fits into your inked strip and the silhouetted sleigh and the sentiment are perfectly positioned. It's unanimous....you are one clever lady! This is such a creative approach to the sketch. The dark to light sponging perfectly highlights the moon and Santa's sleigh. Wow! What a wonderful and creative idea!! I love the moon for Santa! So glad to see you at CAS(E) this Sketch! How AWESOME is this??!! Love how you made the circle a half moon and your strip of color looks like night sky. Perfect CAS card :) Thanks for playing this week at CAS(E) this Sketch! Super take on the sketch. Many congratulations on winning this week! This is darling! Thanks for playing along at CAS(E) this Sketch! Dang...this is CUTE and you don't know where that Santa is from? I would buy that in a heartbeat! Congratulations on your win, Ardyth! This is definitely an AMAZING card and deserves to be highlighted! MASK is an acronym of my family members' names - I am the vowel, the glue that holds it all together! Follow MASKerade on Social Media!